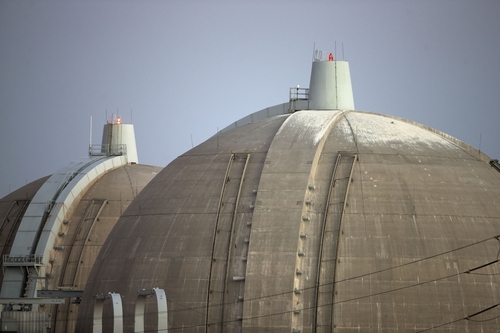 Energy • Measure would establish agency to find interim sites for high-level nuclear waste. Gregory Bull | Associated Press file photo FILE - This Sept. 13, 2012 file photo shows the San Onofre nuclear power plant along the Pacific Ocean coastline in San Onofre, Calif. Two years after Japan's nuclear crisis, Alison Macfarlane, the top U.S. regulator, says American nuclear power plants are safer than ever, but not trouble-free. Washington • A bipartisan group of senators wants to form a federal agency responsible for finding homes for the nation&apos;s scattered stockpile of nuclear waste  but only if the eventual storage sites would welcome the radioactive leftovers. The draft legislation, unveiled Thursday, would implement plans from a blue-ribbon commission that sought to end a stalemate over what to do with tens of thousands of tons of high-level nuclear waste piling up around the nation at nuclear reactors since the Yucca Mountain site in Nevada was shelved. The proposal would allow for temporary storage until a permanent facility is constructed. There are no plans at present to house either in Utah. A consortium of utilities backing a nuclear storage site on the Skull Valley Goshute Reservation has surrendered its license. "Our country can&apos;t wait any longer to find a long-term solution for disposing of nuclear waste," said Sen. Ron Wyden, D-Ore., in announcing the proposal and seeking feedback before the measure is formally introduced into the Senate. President Barack Obama&apos;s Blue Ribbon Commission on America&apos;s Nuclear Future, co-chaired by Utahn Brent Scowcroft, suggested a new, refocused search for sites that would accept 71,000 tons of spent nuclear fuel and high-level waste from the government&apos;s atomic-weapons program. The draft bill would establish guidelines to evaluate potential sites and ask that states and local communities volunteer and consent to housing the nuke waste and require multiple public hearings before studying and finalizing the storage places. Congress, too, would have to agree to the sites. While Wyden and Sens. Dianne Feinstein, D-Calif., Lamar Alexander, R-Tenn., and Lisa Murkowski, R-Alaska, praised the bill as a measured approach, others immediately rejected the proposal. "Consolidated interim storage is an old plan that didn&apos;t work when it was first introduced 30 years ago, or any of the myriad times it&apos;s been proposed, because it does nothing to address broader storage and disposal issues," said Allison Fisher, outreach director for Public Citizen&apos;s Energy Program, a non-profit group established to fight climate change. "In fact, it arguably exacerbates the issues associated with spent fuel disposal." Fisher argues that temporary storage means the radioactive waste will have to be twice shipped around the country, leave potentially underprivileged communities as the only option for the sites and make a few places more of a terrorist target because of the consolidated storage. Thanks to a campaign spearheaded by former Utah Gov. Mike Leavitt, the national standard has become to store the waste in steel and concrete containers at the reactors for up to 100 years. The senators are also pushing to limit the liability for the federal government for its lack of a storage facility that was supposed to be up and running before now. "Nuclear power is our greatest source of low-cost, clean, reliable electricity, and to power our 21st-century economy, we need to solve the problem of where to put the used nuclear fuel," Alexander said. About 20 percent of U.S. energy comes from nuclear reactors.